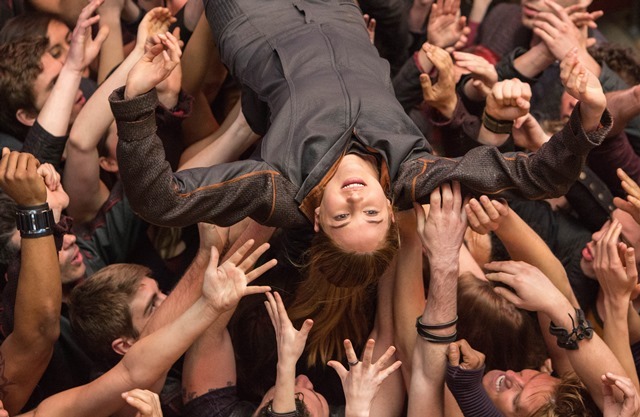 CHICAGO – Despite the best efforts of a game Shailene Woodley and likely future star Theo James, Neil Burger’s “Divergent,” based on the hit book by Veronica Roth, is a joyless, soulless, humorless dud. It is repetitious to the point of parody, never feels like it exists in anything approximating reality, and, like so many “Hunger Games” wannabes, forgets that it’s the characters of that franchise that matter and not the goofy machinations of the plot. “Divergent” is a defiantly silly movie that takes itself as seriously as Shakespeare. It will likely connect with fans of the book simply because it delivers on the cinematic promise of the story they loved but it’s a pantomime, a film going through the motions without a hint of an actual pulse. Set in an overgrown future vision of Chicago (that actually does use the city in fascinating ways in terms of CGI-rendered, post-apocalyptic skylines), “Divergent” imagines a world in which we’re divided into five distinct factions based mostly on the results of a genetically predetermined test. You’re born into one of the character-based factions but you have a chance when you reach a certain age to commit to that group or choose another. The five groups are built on a quintet of relatable human characteristics whether it’s the intelligence-driven Erudite, the charity-centric Abnegation, or the self-explanatory Dauntless. Of course, there’s a sixth group, the legendary Divergent, the people who cross all five factions with their skill sets. And, of course, “Divergent” is the story of one of those unlikely souls. It’s yet another riff on “The Boy Who Lived” from “Harry Potter” or even the destiny of Luke Skywalker. So much of our genre fiction is built around the idea that YOU, dear reader or viewer, could be that special one as well; the one who is not like the others and can lead your people to a greater understanding of humanity and/or save the world. The “Special One” in “Divergent” is Tris (Woodley), a beautiful young lady whose father (Tony Goldwyn) is a leader of the Abnegation faction and whose mother (Ashley Judd) is a supportive friend. Her brother (Ansel Elgort) seems likely to follow the path of his father although leadership within the tribe has been tenuous. When Tris takes her test to determine her faction, she learns that she’s a Divergent but is forced to keep it secret since people fear and even hunt that which they deem genetically superior. But Tris can’t bring herself to stay subjugated within Abnegation, jumping to Dauntless at the last minute, where she meets Four (Theo James), goes through a series of tests/training in her new futuristic variation on the Sharks from “West Side Story”, and makes new friends and enemies. Miles Teller, Zoe Kravitz, Mekhi Phifer, Jai Courtney, and the great Kate Winslet fill out a talented ensemble. A talented ensemble given nearly nothing to do except over-explain the plot. “Divergent” is one of those futuristic films in which they’ve scrambled to cram so much storytelling from the source material into the movie that they forgot the characters. Woodley and James do their best, and do actually have strong chemistry together, but the script keeps puncturing ANY possibility of humor, romance, anxiety, etc. — the elements that make a story like this feel urgent or three-dimensional instead of just required once the book reached a certain sales threshold. There’s no passion here. It’s a filmmaking exercise that simply had to happen instead of anything that people felt creatively inspired to produce. Say what you will about “The Hunger Games” movies, there is a human touch in the performances, direction, and design of those films that somehow, repeatedly, gets lost in films reminiscent of the Jennifer Lawrence uber-franchise. We’re constantly told of Tris’ concerns, tests, saga, etc. but SO rarely shown anything that connects beyond a literal reading of the book. 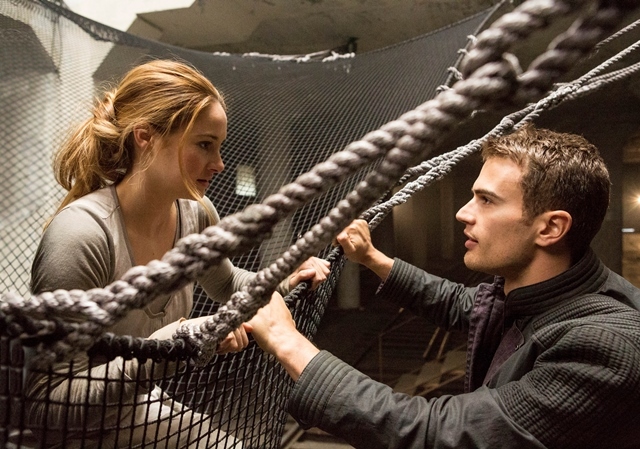 OK, here’s the story of “Divergent,” now why should we care? Don’t just show me what these characters are doing, convince me of the why; the reasons underneath their actions. Otherwise, it’s just a bloated (139 minutes!) piece of marketing; a tie-in to another successful product that has no real justification for existence other than it was inevitable as Beatrice Prior’s genetic destiny. “Divergent” stars Shailene Woodley, Theo James, Zoe Kravitz, Ansel Elgort, Maggie Q, Mekhi Phifer, Jai Courtney, Miles Teller, and Kate Winslet. It was directed by Neil Burger. It will be released on March 21, 2014. Submitted by Karina98 (not verified) on March 20, 2014 - 1:42pm. The movie is weak coz the source material itself is weak, the book it self suffers from the problem of telling and not showing and why we should care. The movie seems like a faithful adaptation of the book based on the reviews, which only further highlights the plotholes in the book. This movie could actually use deviating from the source material coz the basic idea has a lot of potential, but the storytelling doesn’t live up to it. If anyone’s hoping it might get better in the sequels, spoiler alert: it doesn’t. The final installment, if they do make it, is going to make this movie even more pointless, and wonder why this movie was ever made in the first place.